Tonya Harding and the gangsters had it right. Take out the kneecaps, and you eliminate your opponent. Injuries to the kneecap--also called the patella or patella femoral joint-- heal poorly, if at all. Here is why. The kneecap is a sesamoid bone; it lives within the tendon that connects the thigh muscle to the tibia . Unlike other bones, the kneecap is mostly dense, compact cortical bone . It holds relatively little marrow or the spongy tissue that helps other bones absorb impact. The underside of the kneecap, which rubs against the femur, has a thick layer of articular cartilage: the bearing surface of joints . When injured by a blow or a fall, the damaged cartilage rarely heals . Patients often complain of "catching" from the rough damaged cartilage surface, and experiencing pain when bending or going up stairs. Temporizing steps such as injecting lubricants appear to help by reducing the friction between the rough surfaces . Growth factors and stem cells may promote some cartilage healing, though not enough to cure really significant injuries. Physical therapy helps by strengthening the muscles that guide the knee cap in the groove on the femur, and by helping to align the leg and soft tissues . But nothing really cures the damage. Over time, kneecap cartilage injuries lead to painful arthritis. Cartilage repair techniques developed over the last 25 years are excellent for the groove in which the knee cap tracks, successfully treating the damage and arthritis that develops there. But these techniques don't work nearly as well for the knee cap articular cartilage. There are simply not enough stem cells for the marrow stimulating procedures to grow thick enough repair tissue over the knee cap surface. For the most severe cases--where the arthritis has progressed to bone-on-bone at the knee cap the most remarkable recent advance has been the introduction of the Mako robot for isolated patella femoral bionic (or artificial) replacement. This robot brings an extremely high level of accuracy to the process of creating and installing a prosthetic knee joint . As biologically biased as our clinic may be, this robotic method truly superseded what we could do with biology alone at the kneecap. 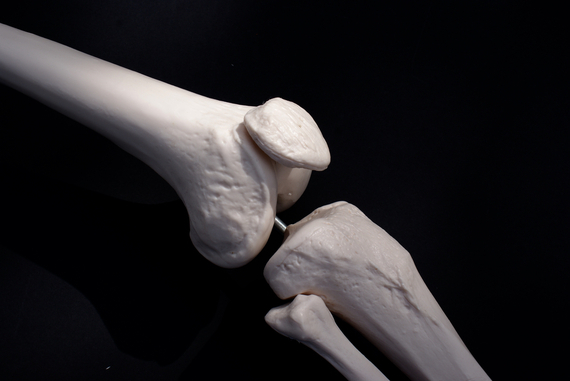 In the past, there were several limitations to artificial patella femoral joint replacements. The shape of the joint was so complicated, and so individualized to each person, that our hand-held guides and surgical methods did not permit us to place the replacement parts accurately enough. Computer-generated modeling, followed by robotic guidance of the surgeon's hand, helped us overcome those obstacles. Once the joint is replaced, patients can return to full activities and sports without pain. The downside is that these new parts (like all artificial materials) will eventually fail--but hopefully not for decades . 1. Townsend, P. R., Miegel, R. E., Rose, R. M., Raux, P., & Radin, E. L. (1976). Structure and function of the human patella: the role of cancellous bone. Journal of biomedical materials research, 10(4), 605-611. 2. Viola, R., & Vianello, R. (1999). Three cases of patella fracture in 1,320 anterior cruciate ligament reconstructions with bone-patellar tendon-bone autograft. Arthroscopy: The Journal of Arthroscopic & Related Surgery, 15(1), 93-97. 3. McCutchen C: Mechanism of animal joints. Nature 1959; 184: 1284-1285. 4. O'DRISCOLL, S. W. (1998). Current concepts review-the healing and regeneration of articular cartilage*. The Journal of Bone & Joint Surgery, 80(12), 1795-1812. 5. Nizolek, D. J., & White, K. K. (1981). Corticosteroid and hyaluronic acid treatments in equine degenerative joint disease. A review. The Cornell Veterinarian, 71(4), 355-375. 6. Deyle, G. D., Henderson, N. E., Matekel, R. L., Ryder, M. G., Garber, M. B., & Allison, S. C. (2000). Effectiveness of manual physical therapy and exercise in osteoarthritis of the knee: a randomized, controlled trial. Annals of internal medicine, 132(3), 173-181. 7. Citak, M., Suero, E. M., Citak, M., Dunbar, N. J., Branch, S. H., Conditt, M. A., ... & Pearle, A. D. (2013). Unicompartmental knee arthroplasty: Is robotic technology more accurate than conventional technique?. The Knee, 20(4), 268-271. 8. Ritter, M. A., Campbell, E., Faris, P. M., & Keating, E. M. (1989). Long-term survival analysis of the posterior cruciate condylar total knee arthroplasty: a 10-year evaluation. The Journal of arthroplasty, 4(4), 293-296.